Posted by thegulfblog.com in Japan. 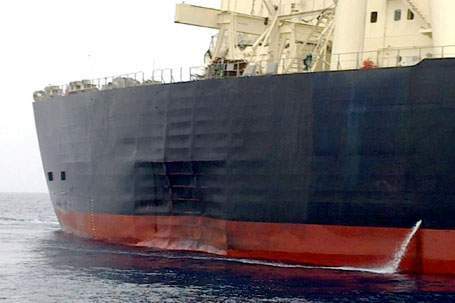 This is a picture of the damage done to a Japanese Oil Tanker in the Straits of Hormuz. The M-Star was on its way from Al Ruwais, Qatar to Chiaba near Tokyo laden with 270,204 tonnes of oil when the incident occurred. There a number of explanations as to what caused the damage. The best explanation spluttered out by nervous Emiratis and Omanis was that it was a freak wave. Now, whilst I am no ship’s engineer, I wholly refuse to believe that a wave – however freakish – could dent a ship in this manner. Nor can I see how a wave could leave an apparent blast pattern just above the waterline. This explanations has overtones of Comical Ali, to me at least. Some reports suggest that the crew reported seeing a flash of light just before impact. This led some to suggest that it was an Rocket Propelled Grenade (RPG). However, the consensus seems to be that an RPG would leave a tell-tale round hole which is not present. The notion that the ship ran into another vessel was also mooted. It would clearly not be the first time that this had happened as Mideasti neatly rounds up. Yet, the lack of scratch marks appears to suggest that this too is unlikely. Overall, the most likely explanation put forward was that it hit a mine that has been bobbing around the Gulf since the Iran-Iraq war. This would explain the location of the impact (close to the waterline), the relative lack of damage (degradation of the mine over the decades) and the shock-wave damage to windows on the superstructure.